Blogger by default has three link in the bottom of each page. That helps the user switch between pages. There we so may methods to change the style of those links or replace links with a button. Later on few amazing developers found a solution to replace those links with Pagination. i.e adding page numbers instead of older post/newer post links. That was really amazing and many used it. As days go on. New trends are being implemented to enhance the user interface. Some of the popular sites like Facebook, Pinterest, Google+, Twitter has an option to load more posts with in the page, instead of loading new page each time when user wants to view old posts. This concept is really cool. This was implemented in various content management systems like Wordpress, Thumblr and so on. Now its time to use them in Google's Blogger. Yes we can add Load More Post links to our blogger footer to load more posts instead of opening new pages. There are so many ways to add this feature to blogger. 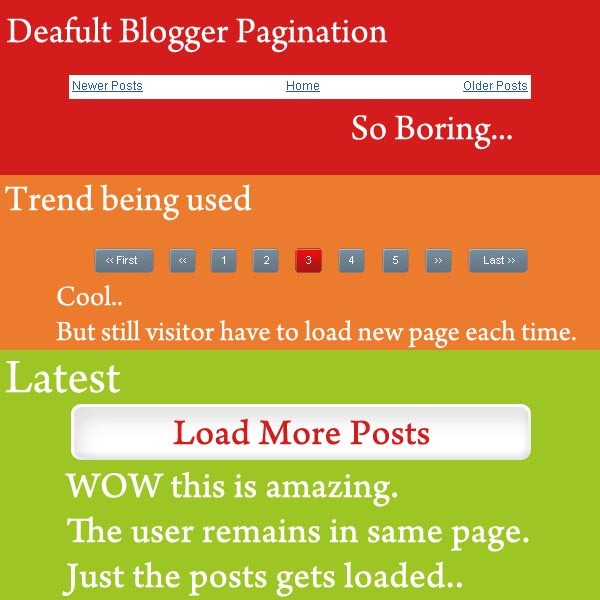 We cant assure which one will suit your blogger template the most. I will share some of the articles which will help you in adding this feature to your Blogger Blog.